Disclaimer: This demo was only playable with PC or Xbox One, of which the latter was chosen. Sitting dead center of the Rooster Teeth Expo in London, Bethesda brought Rage 2 along so they could give the public a feel for what the 2019 first-person shooter has in store. Alongside this, they have the aim of trying to prove why making a sequel to the well-received Rage (released in 2010) was an obvious choice. With Shadow of the Tomb Raider being its only big-name competitor at the event (and even by this time, the game was available worldwide), Rage 2 had very little in terms of vying for dominance on the show floor. Reasonably sized crowds gathered and within 70 minutes, we were able to get our hands-on what Bethesda had to offer. A joint venture between id Software (Doom) and Avalanche Studios (Just Cause series), you immediately felt the DNA of both studios invested in the world. The quick shooting and hand-to-hand combat are clearly Doom inspired, whereas the world itself plays off Avalanche’s 2015 Mad Max. It’s a world that is desolate but one that makes you wonder what’s around the next corner. Set decades after the previous installment (30 years to be exact), the world is in complete ruins. After an asteroid collided with Earth, most of civilization was obliterated in the crash. What remains of the human race are collectives of rogues that have banded together to take whatever remnants of the planet is left. Protagonist Walker, a local law-enforcer, utilized the “Nanomachines” during the asteroid impact to ensure his survival. Serving as a brand-new story but still acting as a sequel to the original Rage, all characters introduced are new, so anyone who skipped the original has no need to concern themselves with missing story beats. We’ve been told there will be hints and nods to previous characters, though nothing substantial. 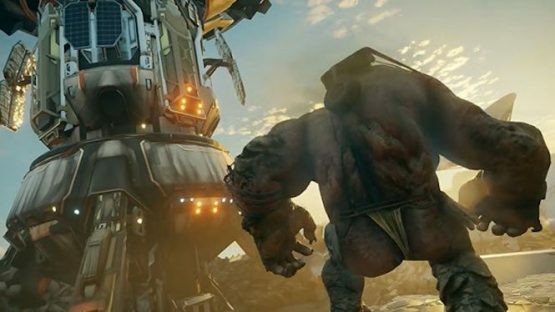 Walking the player through the general rules of the game—controls, specials, artillery, etc.—Rage 2 centers on its most important aspect: Nanotrites. Similar to that of Bioshock’s Plasmids, these Nanotrites give the protagonist special attacks to help defeat enemies at a much faster pace. One of them is increased speed, that will let you dart over to upcoming foes in a blink of an eye. Although during the tutorial, the so-called simplicity of the controls didn’t come across so smoothly, and even when one of the developers attempted to take control, it still acted unresponsive. The game also crashed on another user whilst I was waiting. Not a great sign, however, the demo is an alpha build, so any bugs will hopefully be ironed out by release date. After running through the mechanics, you’re dropped into an orange, murky landscape where up ahead shipping containers lie. Listening carefully, the snarling chatter of bandits can be heard in the distance. The objective here is to reach the control room and frig the system to take down the enemies’ “Eco-Pod.” By immediately making full use of the machine gun, taking enemies out is a cinch. However, being wary is necessary as these punk-obsessed crazies can appear from any corner. Getting overwhelmed? Launching one of the Nanotrites allows Walker to hurl into the air and plummet down with his fist into the ground, consequently obliterating anything or anyone surrounding. Before being able to use this power once again, your meter must recharge itself. Bringing that superhero edge to the player is nothing new, yet it feels very effective and most of all fun to use. Once all enemies were eradicated, a passage becomes clear on how to enter the tech skyscraper. Sprinting is useful too, but what really came across well was the slide mechanic. Again, nothing new, with Far Cry 5 being one of the major releases this year to enable this ability. There’s just something hugely satisfying about running into combat, sliding into a tight spot, and unloading the barrel of your gun. You still need to take caution, as you can easily make the mistake of sliding down what seems an empty gap, only to be mauled by two dozen enemies. Another weapon that gives some added variety is the “Wing Sticks.” This item is making its comeback from the original Rage outing, which is sure to keep long-term fans happy. Once the summit of the building was reached, Walker placed his hand onto the control unit. From this, the ground and building began to shake, and the ginormous “Eco-Pod” crashed down, thus ending the demo. On top of the expansive arsenal of weapons and Nanotrites at your disposal, there is also the special rage ability. When powered up, Walker’s strengths are enhanced for a limited amount of time, thus keeping that core sense of adrenaline and chaos at the forefront. Alongside lots of ammunition, Bethesda is doubling down on vehicles as every transport encountered throughout the story can be controlled—be that land-based or flying. 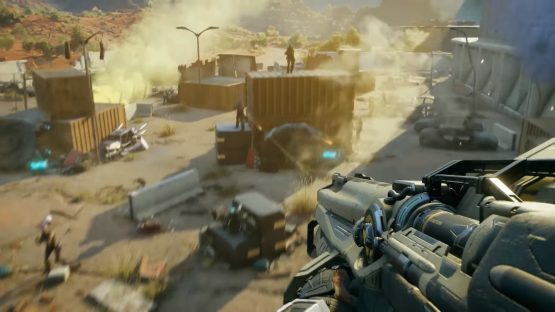 In Rage 2 players will journey through numerous different types of terrain including: jungles, wetlands, mountains, desert, and more. This will only be intensified by the promise that no loading screens will be present at anytime during the game, which should make a more wholesome experience. The developers have also confirmed that at this moment they have barely lifted the lid on Rage 2, and fans can look forward to a much more extensive look at the open-world aspect in the upcoming months. 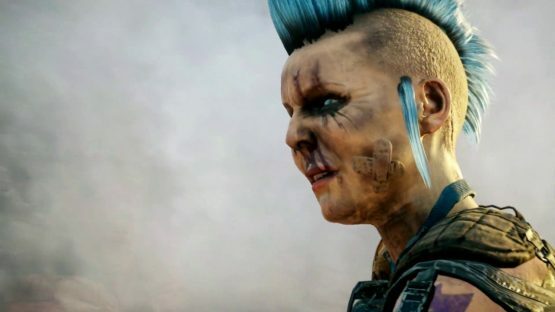 Apart from community features, Rage 2 is a completely single-player experience and is due for release in Spring of 2019 on PlayStation 4, Xbox One and PC.